This project is a six part project that can span the course of an entire unit covering slope. 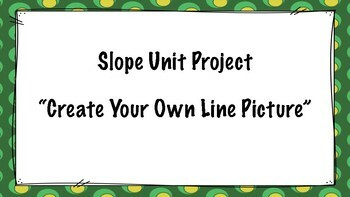 For part 1, which can be done after students learn how to find slope, students will draw a picture with 5 lines with positive slopes, 5 lines with negative slope, 5 lines with a zero slope, and 5 lines with an undefined slope. Part 2, students write the equations in point-slope form. Part 3, students write the equations in slope intercept form. Part 4, students write the equations in standard form. Part 5, students find the domain and range of each line. Part 6, students copy the equations in point-slope form with the domain and ranges and see if a classmate can recreate the drawing. As the parts of the project continue, the project will slowly incorporate newly learned topics relating to slope and linear equations. 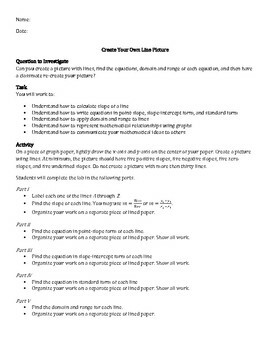 This project can also be done at the end of a unit on linear equations. Please feel free to contact me if you would like an editable version.